IN SHAPE: Geir Thorsen from Søgne suffered from Behkterev's disease for several years and it was challenging to be active. After he was healed in 1996, his body works normally. "Lately I've been cutting wood for several years to come," he said pleased. In 1977 Geir Thorsen from the town of Søgne started working as a plane steward for the airline SAS. Scandinavian Airlines. He therefore traveled around the whole world and visited many countries, including North and South America, the East, Africa and all of Asia. -In the middle of 1980 I began to get stiffness and pain in the back, pelvis, hips and inside of the thighs. The ailments varied and came in periods, but they worsened. Geir was at the doctor several times. His general practitioner finally sent him to a hospital in Oslo for a more thorough examination. -I had X-rays performed and had various other examinations conducted. After a couple of hours, the doctor could confirm that I had Bekhterev's. That's what they had suspected. I could even tell from the pictures that I had inflammations in large parts of the body. The doctor advised me not to find out more about the disease. He was most likely concerned that I would worry about the future. The disease is incurable and can be very bad for some. Bekhterev's disease is a chronic rheumatic inflammation. About one percent of the population has Bekhterev's disease (50,000 Norwegians). The most important treatment methods are physical activity and pain relievers, but the disease is incurable. 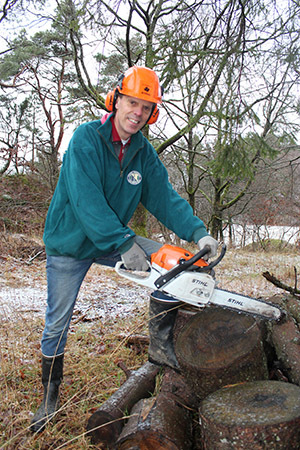 For Geir, the disease became a challenge especially in relation to his job. -The first time I got really sick was on a trip to Anchorage in Alaska. When I woke up in the morning, I couldn’t get out of bed. I had to call the captain and say that the return trip had to be without me. This repeated itself several times. I never knew when the pain would come. If I was at work, I had to bite my teeth together. At the worst, I had to sit down and the other staff had to manage without me for the rest of the trip. During periods Geir used painkillers. Training also helped keep the disease at bay. Nevertheless, he was on sickleave several times. At worst he could stay for two to three days in bed without moving. -When I lived alone in Oslo, I sometimes had to call people who could provide me with food. When I was in the store, I could struggle to carry two shopping bags. Eventually, I moved to another place in Oslo. Then a moving agency had to take the whole job. Geir was a Christian and despite the gloomy prospects, he believed in his heart that things would go well. He hoped that God would heal him. On 7th March 1996, Svein-Magne Pedersen participated in a debate program on TV2. The theme was healing by prayer, and at the end of the program Pedersen was allowed to pray one minute for all television viewers. -When Pedersen prayed, I laid my hand on the television. I didn't have pain that day, so I couldn't notice if anything happened. The days passed and soon it had been both weeks and months without Geir getting sick. Something must have happened. -My wife was very surprised, because she was used to me always having to take it easy and that I was in pain. Now it's been over 21 years and I'm just as healthy. I run, ski and have recently participated in building a new house in Søgne. The pain has never returned. Geir has also been at the doctor after he recovered. Once he pointed out that Bekhterev was in the journal. -No, I don’t have that any more. I have been healed, Geir said. -Yes, I've heard that such things have happened, the doctor replied. Geir can also tell of another miracle that the family experienced in 2011. His son was then six years old and had suffered from asthma up until then. -The doctor called it "severe asthma" and my son used the first-aid kit several times a day. He had a lot of mucus in the throat and coughed a lot. In 2009, they followed Pedersen twice and received a prayer, but nothing happened. Nevertheless, the family did not give up. Two years later, Pedersen had a meeting in the Oasen Bible Center in Søgne. There the son got a prayer for the third time. -From that day on, the condition was reversed and we went to a specialist for an annual check shortly after. He could then tell that my son was well. It was great to hear! -This shows that one must not give up. The Bible is full of promises of healing. Expect that God will heal you and seek prayer for something happening.